Alla Kudryavtseva was presented with her Bachelor of Arts in Communication Studies degree by IU East Executive Vice Chancellor Michelle Malott and School of Humanities and Social Sciences Dean Ross Alexander at IU East on December 13. Monica Puig won the first gold medal in any sport for Puerto Rico. Puig made Olympic history after she defeated Germany’s Angelique Kerber 6-4, 4-6, 6-1 on Saturday, August 13. Indiana University East and the Women’s Tennis Association (WTA) celebrated a successful first-year partnership on Sunday, August 10. The WTA and IU East commemorated the partnership with a plaque in recognition of the exclusive educational agreement for players during the Western & Southern Open tournament at the Lindner Family Tennis Center held just north of Cincinnati, August 9-17. Red Wolves ruled the desert at the Women’s Tennis Association’s (WTA) Dubai destination. Indiana University East online students swept the women’s singles and doubles championships at the Dubai Duty Free Tennis Championships in late February. Venus Williams won the singles title at the WTA Dubai event. 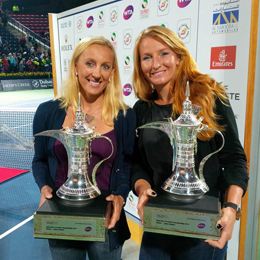 Alla Kudryavtseva and Anastasia Rodionova won the doubles championship. 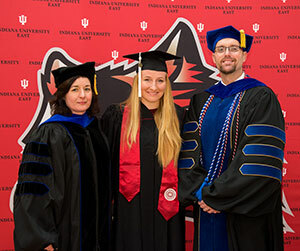 Williams, Kudryavtseva and Rodionova all are enrolled in baccalaureate online degree completion programs at IU East. 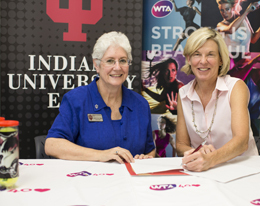 Indiana University East and the Women’s Tennis Association (WTA) agreed August 13 that the university is the primary provider for baccalaureate online degree completion programs for WTA players. The agreement was made official with a public signing at the Western & Southern Open tournament at the Lindner Family Tennis Center held in Mason, Ohio just north of Cincinnati.